If you want to be able to enjoy racing in the Mediterranean and party in style at the same time, you might want to consider a tandem charter with Giorgio Armani’s chic on-water chill-out pad Mariu and sleek performance-sailing sloop Nefertiti. 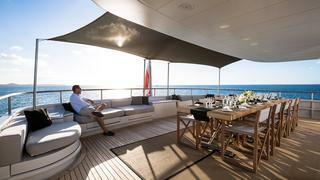 Mariu is one of the best charter party yachts and has all the latest technology as well as an extensive toy box. Sailing yacht Nefertiti is for sale and was built by Nautor’s Swan in 2010 and has raced on both the Mediterranean and Caribbean circuits and made numerous transatlantic crossings. Mariu and Nefertiti are managed for charter by Edmiston . If you want to be able to enjoy racing in the Mediterranean and party in style at the same time, you might want to consider a tandem charter with Giorgio Armani’s chic on-water chill-out pad Mariu and sleek performance-sailing sloop Nefertiti. 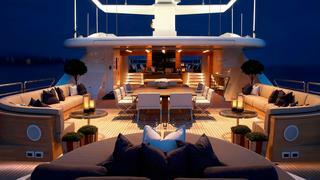 Mariu is one of the best charter party yachts and has all the latest technology as well as an extensive toy box. Sailing yacht Nefertiti is for sale and was built by Nautor’s Swan in 2010 and has raced on both the Mediterranean and Caribbean circuits and made numerous transatlantic crossings. Mariu and Nefertiti are managed for charter by Edmiston . If you want stylish adult surroundings but also want to keep the younger generations entertained then chartering Sealyon 62 and Sealyon 37 _can give you the best of both worlds. _Sealyon 62 offers 1930’s glamour and luxury facilities for grown-ups while Sealyon 37 can keep teenagers entertained with its huge toy store. Each party can enjoy their own space but meals can still be enjoyed together. If you want to take a huge group of friends to Ibiza on a superyacht but still be able to nip in and out of the bays and discover the hidden sides of the island you should consider a superyacht tandem with Tiger Lily of London and Sherakhan. The 69 metre yacht Sherakhan, which is currently for sale, can be your base camp with up to 26 guests, a spa, 18 person Jacuzzi, and enough deck space to party of chill out at sunset. The 27.4 metre Tiger Lily of London can then be on hand for those who fancy some time out to discover little bays, trips to shore for a bit of shopping or popping over for lunch in Formentera. If you want to have added entertainment during your vacation why not consider chartering both Sarah and Berzinc. 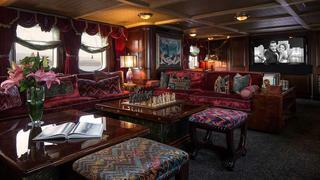 Charter yacht Sarah boasts 19 crew and a no fewer than nine staterooms. She also has an extensive sundeck with a bar and large Jacuzzi. To complement her, yacht for charter Berzinc has been used in tandem previously as a support vessel to carry an enormous floating playground and more toys, as well as additional staff and actors to put on incredible theatrical performances for the guests. 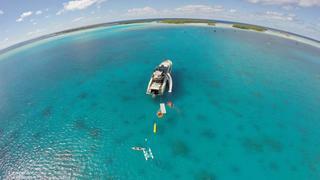 Sarah and Berzinc are managed for charter by Ocean Independence. Luxury yacht Berzinc is also currently for sale. If you want to have added entertainment during your vacation why not consider chartering both Sarah and Berzinc. Charter yacht Sarah boasts 19 crew and a no fewer than nine staterooms. She also has an extensive sundeck with a bar and large Jacuzzi. To complement her, yacht for charter Berzinc has been used in tandem previously as a support vessel to carry an enormous floating playground and more toys, as well as additional staff and actors to put on incredible theatrical performances for the guests. 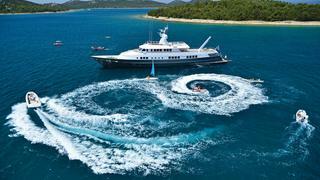 Sarah and Berzinc are managed for charter by Ocean Independence.Luxury yacht Berzinc is also currently for sale. Amphitrite and Fair Lady are a great pairing if you are looking for two superyachts with character and vintage personality. Fair Lady dates from 1928, whereas Amphitrite was built in 2001. The duo are perfect for fancy dress parties on charter and anyone looking for something a little quirky. Both are immaculately maintained and have the long-serving crews. 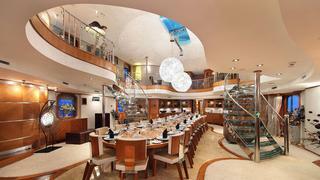 Short-range yacht Vantage cruises in tandem with Advantage. She not only serves to refuel Vantage but also carries endless toys — the most impressive of which is a submarine. As well as using the subrmarine to discover the underwater world the South Pacific you can also take advantage of numerous tenders and jet-skis that will give you direct access to Tahiti's beautiful shores. Vantage and Advantage are managed for charter by Camper & Nicholsons. Short-range yacht Vantage cruises in tandem with Advantage. She not only serves to refuel Vantage but also carries endless toys — the most impressive of which is a submarine. As well as using the subrmarine to discover the underwater world the South Pacific you can also take advantage of numerous tenders and jet-skis that will give you direct access to Tahiti's beautiful shores. Vantage and Advantage are managed for charter by Camper & Nicholsons.